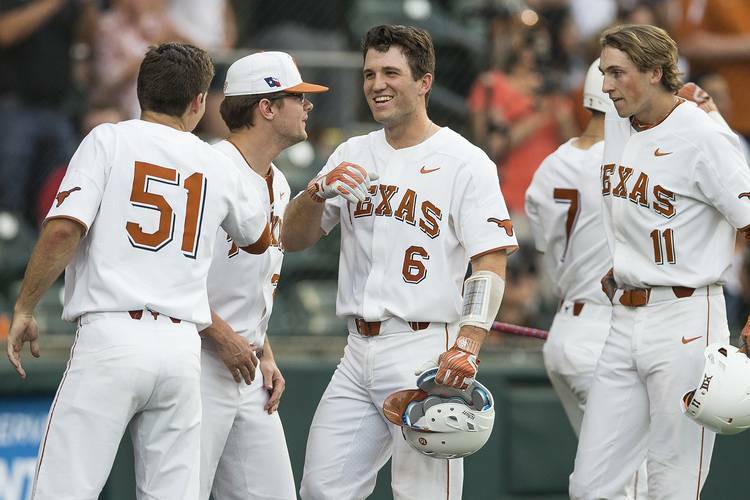 After ending last season on NCAA’s biggest stage, Texas will still be in the spotlight when the curtain rises on the 2019 baseball season. Texas was ranked 23rd in D1Baseball’s preseason poll, which was released on Monday morning. Vanderbilt topped the organization’s rankings, and No. 3 Texas Tech was the first Big 12 team to make an appearance. Five Big 12 teams made the cut, but UT found itself looking up at Texas Tech, No. 15 Baylor, No. 18 Oklahoma State and No. 19 TCU. Texas went 42-23 and won the Big 12’s regular-season title during the 2018 season. Five of UT’s wins were secured during a postseason run that reached the College World Series. The Longhorns will have to remake their pitching staff this season. All-conference honoree Blair Henley, though, is among the four returnees who threw at least 30 innings in 2018. Texas will open the season with five healthy position players who started in at least 55 games last year. Texas sent its top hitter and the Big 12’s best player (Kody Clemens), its top two starters (Nolan Kingham and Chase Shugart) and three reliable options from the bullpen (Josh Sawyer, Andy McGuire and Parker Joe Robinson) to the minor leagues. Utility player Jake McKenzie, who was the team’s first baseman for much of last year, also graduated. The Longhorns must also replace all-conference shortstop David Hamilton, who will miss the season with an Achilles injury. Hamilton’s injury was announced by Texas on Saturday. D1Baseball co-managing editor Kendall Rogers tweeted that news about Hamilton did impact the Longhorns’ position in the polls. Texas is set to open its season on Feb. 15 when it travels to unranked Louisiana Lafayette for a three-game series. Twenty-one games on Texas’ schedule are against teams ranked in D1Baseball’s preseason poll. Fifteen of the those 21 games will be played within a 24-day span in March.